After a competition was held to build the organ, the College awarded the contract to the W. W. Kimball Company of Chicago. Three proposed designs were suggested; the one that was accepted allowed for a four manual specification with an Echo Organ that was never installed. The organ was placed in two large chambers on either side of the chancel. By looking at the two relatively modest-sized organ screens one would have no idea how large the organ actually is. But these small pipe fronts allow an amazing amount of sound to come pouring into the chancel. 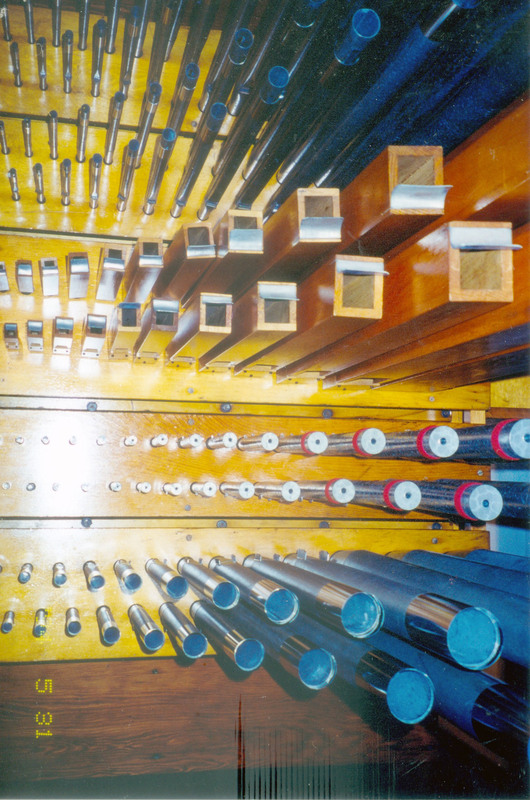 When we first saw the organ in 1998, some changes had already been made to it. The original Kimball tab console was gone, and in its place stood a rather inglorious trade supply-house console that was in poor condition after about twenty years of use. All of the Kimball switching in the two chambers had been replaced with unreliable electro-mechanical apparatus, as were the Kimball individual-swell shade engines. Since the two chambers are placed in such a way as to have mostly exterior walls, the tuning problems in very hot or cold weather were troublesome. Thick, soft insulation had been applied to the chamber walls in an attempt to reduce the effects of cold weather, but it only seemed to help slightly if at all, and the soft surfaces absorbed much of the organ’s tonal output at the same time. At some point, electric heaters with forced-air fans were installed to counteract the chilly winters of the area, but these only exacerbated the difficulties and created strong air currents and a lot of noise when they were running. A contract for the restoration was signed in late 1998 and the work completed by August of 2000. The chambers were done sequentially, thereby allowing some of the organ to be available for services in the chapel. When the pipework and mechanism were removed, the walls and their insulation were covered over by sheeting material that was then given several coats of a hard, glossy paint. Additional incandescent lighting was provided to make servicing more practical and convenient. All of the organ’s mechanism was restored to its original condition and the chassis of the organ given fresh shellac finish, revitalizing its appearance. Chests were releathered and regulators rebuilt with double-gussets for longer life. The missing Kimball swell motors were replaced with Skinner whiffletree engines connected to the expression shade trace rods in a special way suggested by Nelson Barden of Boston, in order to secure a more gradual opening sequence. 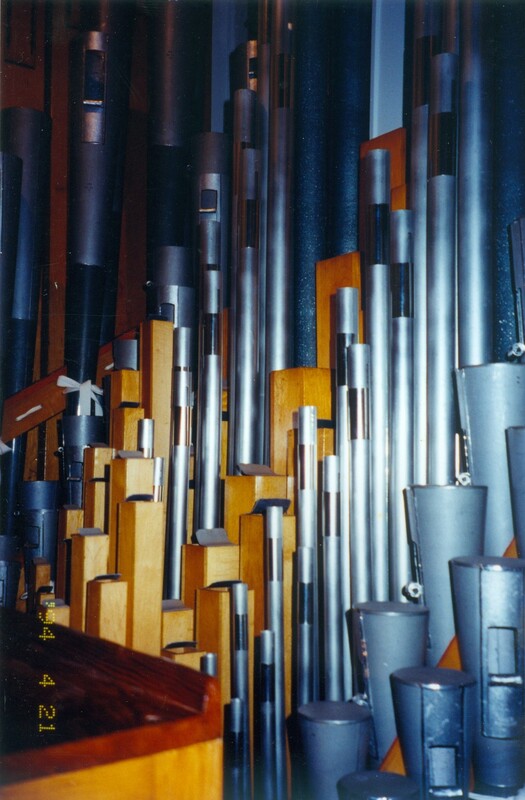 The pipework of the organ received special treatment as well. The flue pipes were washed and repaired; new tuning slides were installed matching the old corroded ones. Wood pipes were given a rejuvenating coat of shellac. Reed pipes were cleaned and furnished with new regulating scrolls and brass wedges for enhanced tuning stability. 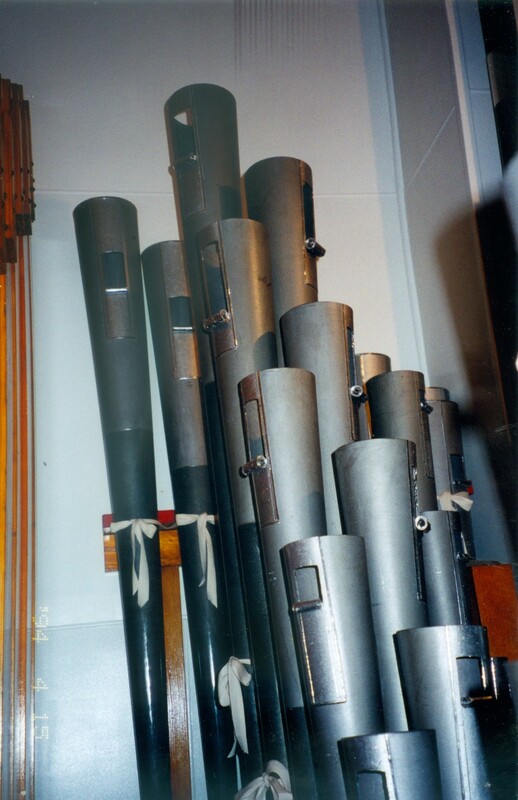 Today the organ’s pipework looks and sounds like new once more. As the project began, we learned of a period Kimball console that was going to become available, from Ohio Wesleyan University. 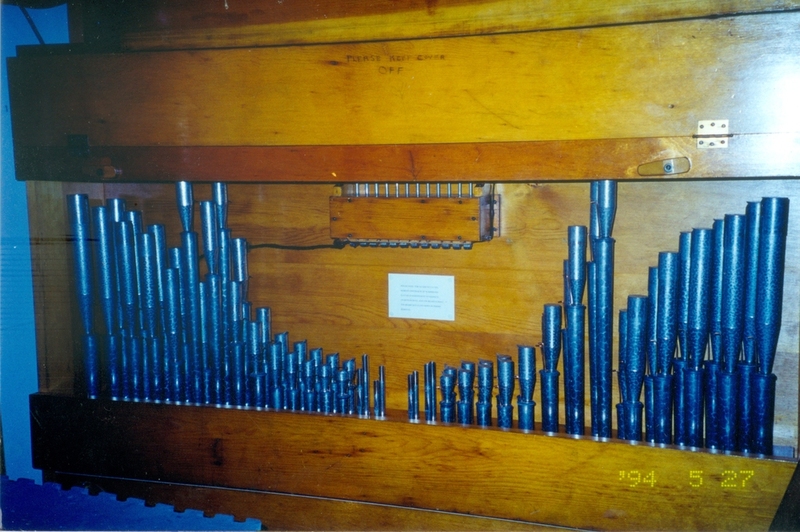 This was a large four-manual drawknob type, and Nelson Barden and Associates were engaged to rebuild it and adapt it to the needs of the Grove City organ. Mr. Richard Houghten was given the job of installing it and the new switching equipment in the organ chambers. The organ was re-dedicated in late 2000 with a service followed by a recital by Prof. Thomas Murray of Yale University, internationally known for his musical skills and familiarity with organs of this type. Today the instrument continues to be presided over by Dr. Richard Konzen, who uses it for chapel services and teaching.